This is the latest one I finished. It definitely goes in the Monet set of blocks. This has three batiks in it as well as the metallic fabrics. I love the metallics but they are a bit thicker than normal quilting cotton and definitely thicker than a batik. 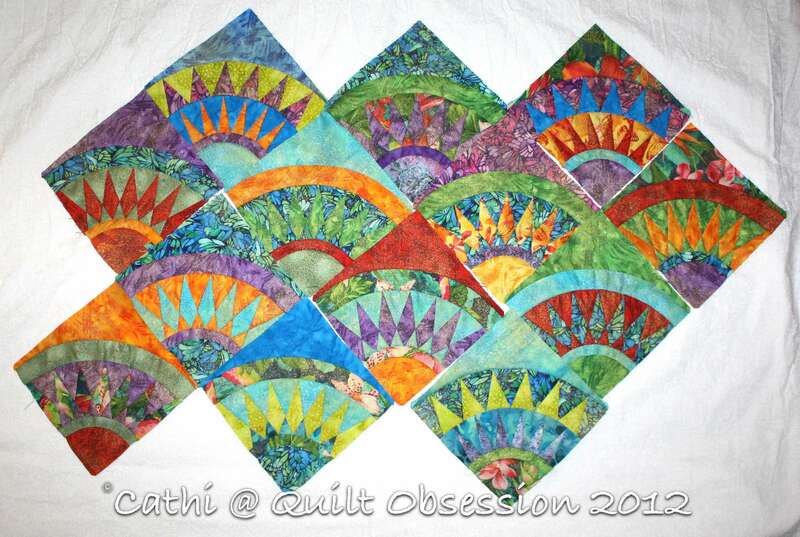 The batiks in these blocks will help to cut down on the weight of the quilt, whatever size it ends up to be. I’m amazed that 13 of these blocks are already finished. 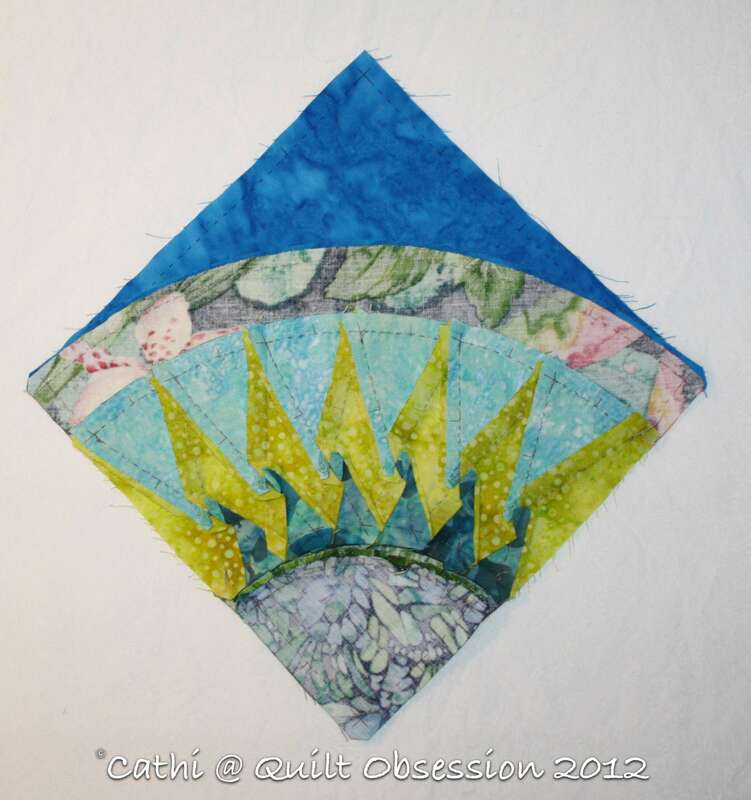 I had always wanted to make a New York Beauty quilt, but paper piecing? Not for me, too much machine work. Trace the templates? No, nowhere near as accurate and thin a line as I’d want. But being able to print the templates on my fabric? I was in! In seconds! That’s the beauty of Inklingo – printing on fabric and getting perfect cutting lines, perfect stitching lines and perfect matching points. It makes even the sharpest of points easy to stitch whether by machine or by hand. Seams graded on the latest block and it pressed beautifully. Of course the batiks help. It is a bit more of an effort to get the blocks that have all metallics in them to press to their best advantage but it’s worth the effort as I love the effect they give. I think I’ll make two more of these blocks and then start playing with setting ideas. I have a few ideas so the temporary design wall may be put up within the next few days so I can play. Clearly I’m making a series of these quilts as I have lots of blocks still to stitch but I don’t want to make these large quilts. I’d rather see them as colour-saturated small pieces to hang on a wall. Still no flowers on the roof garden, but Baxter is on patrol on the windowsill. Mostly at night, though. He clearly seems something out there that we don’t see. He’s not as interested in watching out the window during the day as he is at night. Mr. Q.O. captioned this one, “Don’t try this yoga pose without an attendant.” We call this one Baxter’s pretzel pose. 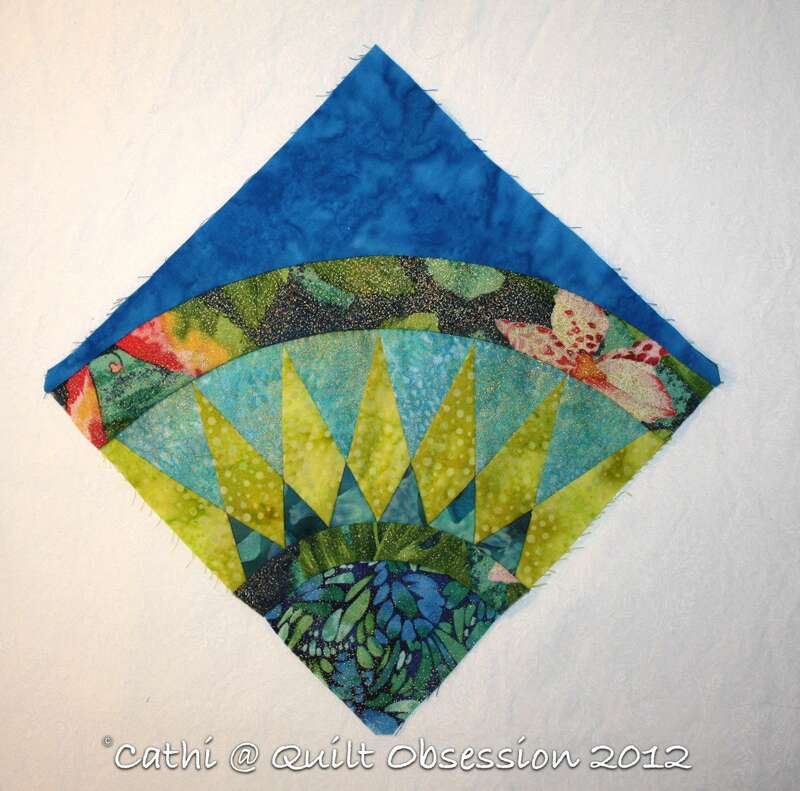 Beautiful work Cathi. I could sit and stare at these blocks all day. Truly a work of art. You are amazing! You should have seen me tilting my head and body sideways as I first saw this photo of Baxter, trying to figure out how he had his body. I laughed out loud at myself. lol This is priceless. Those blocks are gorgeous! Or, as my sister would say, scrumptious!!! Can’t wait to see how you set them together. And Baxter’s pose makes my back hurt! Maybe that has to do with the weeding I’ve been doing…makes old bodies ache! 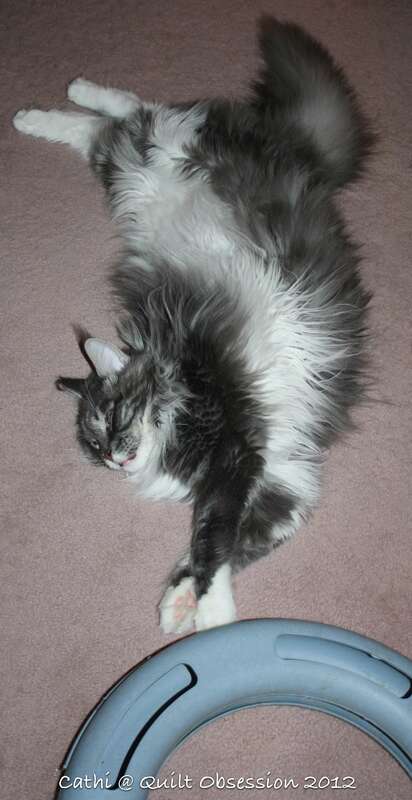 Wouldn’t it be wonderful to be flexible like a cat? Your little blocks are glowing like stained glass with the sun shining through!